... I started reading her book because I knew how influential she was on the world of writing and women. She was a genius; able to look at two books simultaneously and see how they could so easily meld into one script. Able to capture the complex relationships between men and women and write them into a script that captured the hearts of both... and she was able to translate being a feminist in a man's world into a solid career that paid off without a ton of compromise. She was the type of person who wasn't afraid to get it wrong, about face and get it right only to discover that maybe she had gotten it wrong again and about-face all over. I don't understand that type of courage and in my confusion of her audacity and strength, I am a bit jealous and a bit angry that she kept these secrets and tucked away her imminent death. It was her right... and I wouldn't want to take that away... but I am saddened immensely by it. For writers like me, she was a hero... this golden god on a hill that could brink out scripts that we could only dream of. Women pried to be like that. She's right up there with Gloria Steinham for me. What dream can I hold when it'll never be to meet her? I am sad that she is gone... I don't have many heroes, to be honest, but there have been so many of her films that I have watched and re-watched and felt a connection to. Writing can be a vague sort of profession; some of us like it that way and others of us are looking for something more. 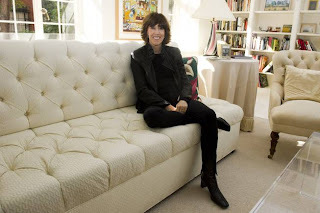 Yet still, some others of us stumble upon something that strikes a cord in the hearts of the masses and that, I believe, is what Norah Ephron did for women the world over. There are a ton of women like me, sitting at home and viewing that name on the screen and feeling a kick in the chest. This post is for them... we'll miss you Norah. We'll miss your Crazy Salad of honesty, feminist ideals, and funny moments. You brightened our world, warmed our hearts and told us that we are more... and we intend to be more still.